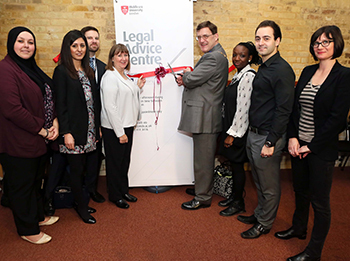 Middlesex University has opened its own Legal Advice Centre (LAC) today (28 November) to help members of the local community affected by the government's decision in 2013 to limit access to legal aid. The LAC was officially opened last week by the Mayor of Barnet, Councillor Hugh Rayner, who was joined in cutting the ribbon by Associate Professor Susan Scott-Hunt, who heads the University's Clinical Legal Education programme. Also in attendance at the ceremony was the Dean of the School of Law Professor Joshua Castellino, who said: "This is a real attempt to serve the local community in a meaningful way and we have a stellar cast of people behind the Centre." The LAC is being led by Middlesex graduate and principal of Hendon legal firm STS Solicitors, Husniye Sera Ustek-Bazen. She will be assisted by two current students, Team Manager Joseph Stoll and Malack Marwan, who will between them conduct the initial interviews with clients. As well as gaining invaluable work experience, LLB student Joseph said he was proud to be serving those in need in the local area. "Middlesex University facilitates and teaches its students to use their knowledge for the good of their community," he said. "Students like myself and Malack will be able to make a positive impact on the community by improving the lives who may be most vulnerable and in need of legal advice." Members of the public, as well as staff and students at Middlesex, can book an appointment between 2pm and 4pm on Fridays during term time to receive free advice on a range of legal issues including housing, children and family, and debt and bankruptcy.